U.S. Secretary of State John Kerry made a visit to Kabul recently, though this trip was not announced beforehand. Washington is hurrying to resolve the contradictions in relation to the agreement on security cooperation they made with Afghanistan. This concerns the legal framework for the conservation of the American military presence, the conditions of their operations, as well as of the further support of local security forces. The White House actually categorically insists that President Hamid Karzai should sign the document before the end of this month. Such a deadline for the completion of the “deal” was defined by the U.S. President Barack Obama. Washington is hurrying to finish on a positive note the failed project – “Americanization of Afghanistan”. At the same time, pushing the talks with the official Kabul, the Americans are trying to come to a beneficial agreement with the Taliban, who have long argued: Karzai has no future in Afghanistan. Apparently, this is the reason why, Karzai is in no hurry to take on specific commitments to the Americans, refusing to agree on a timetable of military withdrawal and dodging to determine the prospects for the U.S. military presence in Afghanistan after 2014. Unwilling to sign the document, Karzai is ready to postpone the matter until his retirement from the presidency, and shift the responsibility for concluding the fateful 10-year military agreement with the U.S. to the new government. 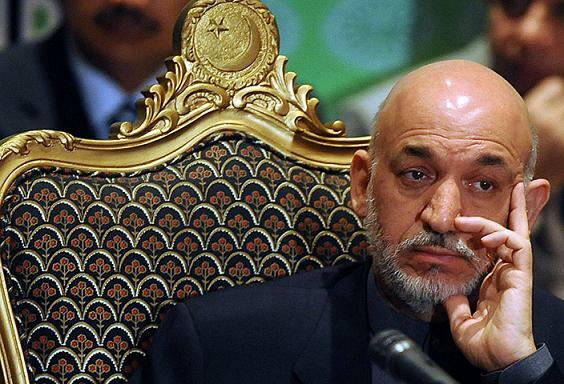 One can understand Karzai’s touchiness. So far, he has not managed to obtain any guarantees for his personal safety and “at least some kind of political future” from the Americans. This time around, the foreign minister of the United States did not focus on personal guarantees for his intractable partner, he wanted President Karzai to take concrete measures, but again, this did not work. The assurances of the U.S. State Department that followed, after the departure of Kerry from Kabul, that the talks will continue at a lower level, cannot be a basis for optimism. Most likely, the Americans will have to come to a final agreement with the Afghan side after the presidential elections, and not with Karzai, but the new leader of Afghanistan. The elections for a new president, which are to be held in the April of 2014, will be a major test of strength and a kind of “moment of truth” for the Afghan state and society, as whole. The constitution prohibits the incumbent President Hamid Karzai to run for a third four-year term, but Western partners require him to retire, by “holding free and fair presidential elections”. Now there is an unpredictable balance of power in the country. However, as it is everywhere after the cessation of U.S. military intervention, the country is in a state of uncertainty and chaos. The struggle for power between the official government, the Taliban, mujahedeen and warlords continues following the scenario of the civil war, but so far in a passive phase. It is hard to believe the current government officials, led by President Karzai, are willing to voluntarily retire and will peacefully negotiate with their implacable opponents. They will hardly manage to ensure legitimate and even secure elections, at the time when the national police and local police self-defense units in Afghanistan are weekly losing more than 100 killed and about 300 wounded people. After all, free elections in Afghanistan would, no doubt, become an event of historic proportions, but the prospect of their fair conduct is assessed as extremely insignificant. Moreover, the Afghans themselves admit that the election might not take place because many areas are actually controlled by the Taliban. The Taliban regime was removed, but was not destroyed. It turns out that it is impossible to ensure stability in Afghanistan, without including the Taliban in the current political system. Many predict that if the Taliban nominated their candidate for the elections, he would have received the unconditional support of the majority of the population. However, the Taliban do not intend to participate in the upcoming presidential elections in April 2014, giving preference to the use of the “rule of force”. Mohammad Omar, the founder and leader of the Taliban, will not cooperate with the official Kabul, will not give up the armed struggle and will try to regain power, in order to recreate the Islamic Emirate. The Taliban are still supported by Pakistan and their funding through the Pakistani Inter-Services Intelligence, often occurring without the control of the official authorities, has not stopped all these years. Saudi Arabia and the United Arab Emirates are on the side of the Taliban, Qatar and other Gulf monarchies sympathize with them. Finally, the Americans, on the eve of withdrawal of their troops, have stepped up contacts with the Taliban behind the official Kabul. The Taliban are no longer enemies of the United States – this was stated by the Vice President of the USA Joe Biden. Washington is ready to radically change the old concept of “war on terrorism”, which by renewing its friendship with the Afghan terrorists, has relegated to the archives its diplomatic stance in Afghanistan. President Barack Obama has authorized the settlement of the Afghan conflict through the involvement of the Taliban regime. Among the demands of the U.S. there are the cessation of armed resistance, refusal from contacts with Al-Qaeda, and the promise to comply with the Afghan constitution. As it can be seen, there virtually are no obstacles to the friendship between the United States and the radical Islamists from the Taliban movement. Only a few questions remain, the most interesting of them is: what will the 30,000 armed Taliban do under the current Afghan constitution, who are supported by an extensive network of base stations among the population of Afghanistan? Does Washington really believe that hundreds of tribal chiefs, in whose eyes Karzai is an American puppet, will look for ways of cooperation with the current government? Kabul has few chances of finding common ground with the Taliban, and the Americans do not have many either. Given the most optimistic scenario, cooperation with the Taliban could lead the United States, according to the leaders of the Taliban, only to “a peaceful ending of the occupation of Afghanistan”. Formally, the United States has completed the tasks they set for themselves at the beginning of their campaign in 2001. They eliminated bin Laden, stripped the Taliban regime of power and laid the basis of statehood in Afghanistan. They can only hand over the control to the national security forces in Afghanistan and leave them face to face with the Taliban. By March 2014, the Afghan forces should take over full responsibility for security, although fights with the Taliban have not stopped, so far. The year 2013, has become the deadliest for the Afghan Army since the arrival of coalition forces in the country. The actions of the Taliban are becoming more aggressive and the forces of the international coalition, on the contrary, are avoiding participation in hostilities, leaving the Afghan forces alone with their inability to fight. Now, the number of dead Afghan soldiers is three times larger than the total losses of the coalition and Afghan forces in 2010 and 2011. Given the current level of losses, the Afghan Army will not be able to hold out for a long. In these conditions, the withdrawal of the U.S. from Afghanistan, without hope of at least a minimally controlled situation, would mean defeat for the United States. There is no doubt that terrorists will again have the opportunity to use this country as a springboard. We should not forget that for twelve years, the United States and its allies in the international coalition has led anti-terrorist operations in Afghanistan against the militants of the radical Islamist movement of Taliban. At least, the Americans considered it to be like this, which are now allowing the repetition of their alliance with the Taliban. It is impossible to understand the logic of the American people: they kill so many people and throw away billions of dollars, in order to kill one terrorist, and then surrender Afghanistan into the hands of his followers! Nikolay Bobkin, PhD of Military Sciences, Associate Professor, Senior Researcher at the Center for Military-Political Studies, Institute of the U.S.A. and Canada, especially for the online magazine New Eastern Outlook.